Thu, 24 Oct 2013 | Published in I Was There . . . 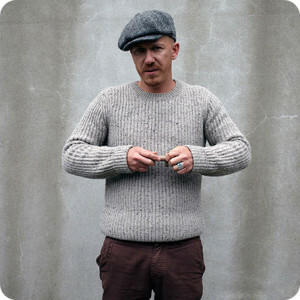 The first time I saw Foy Vance live, he was headlining the 2011 Craic Festival. He went on after midnight after a dizzying array of Irish acts. That crowd was a bit impatient and drunk, but within minutes, Vance’s particular fusion of folk and soul had entranced everyone. Much has changed for Vance in the last couple of years. He has opened for a few high profile acts, including Ed Sheeran and Bonnie Raitt, and Glassnote Records recently released his long awaited sophomore record, the remarkable Joy of Nothing. Vance opened Glassnote’s CMJ Showcase at The Slipper Room, and his performance was just as charming as ever. Though Vance has often performed with just guitar or piano to augment his soulful voice, this time he was joined on drums by Peter McCauley (RAMS’ Pocket Radio), the opening act on his current headlining tour. Vance’s set was focused solely on tracks from Joy of Nothing, and the percussion and backing vocals gave his set a new, more nuanced dimension. There was no shortage of crowd participation as well. Vance cheekily dubbed this singing “church without the boring bits” as we sang the chorus of “Feel for Me,” which did feel like a sort of spiritual experience. However, the crowning glory was, as always, the closing tune “Guiding Light.” Vance teased that when he performs the song in New Jersey, they sing it a full hour after he leaves, which was of course the perfect way to motivate a bit of New York competition. After singing with us for a while, he triumphantly made his way through the crowd, surrounded by the words he had penned. Be sure to snag tickets for his concert at Bowery Ballroom on November 4th.